My partner and I went for lunch at a New Hampshire diner. The town where the diner is located is 85% White. The diner’s décor is supposedly based on “the original 1952 Worcester Diner Car #837.” The walls are graced with Americana kitsch; Elvis Presley statue, mason jars, the Mr. Peanut Head statue, a Hawaiian women with grass skirt, and the racist image of Mammy in the form of cookie jar, a robust African American woman dressed in apron and head scarf. 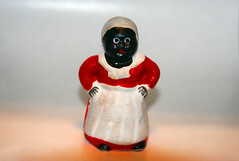 You can easily find images of this kind by typing, “mammy cookie jar” in your browser. My partner, who is White, respectfully complained about the inclusion of the Mammy Cookie Jar. He shared that he viewed this type of image as discomforting, especially while dining, and that is was a painful reminder of American History. He talked about the racist nature of such imagery. The response of the manager, who was a white woman, was unfortunately typical: “She liked the jar.” “She didn’t think it was racist.” “The jar had been in her possession (or had been in her familys’, I don’t remember the exact answer) for a long time.” In short, she was not persuaded, Mammy would stay. The use of African American faces and characterizations like those found in Mammy, Uncle Ben, and Aunt Jemima, become key ingredients in the brand product marketing. Marketers and advertisers use the comforting feelings that Whites (and uninformed people of color) gain from viewing historical legacies of exploited African American slave labor. The use of historically derived African American on food products serves as a comforting sign of White stability and safety, emotional safety. These racist images serve as iconic metaphors promoting Black subservience to others, a direct reference to American slavery. I am not talking about the collection of these images in one’s home, as many African American collect these products as memorabilia or as reminders of our past, but my objection is to the display of these images in quasi-public spaces. Previous Post Reflections from Australia: An American First and then African American? When I was a kid in the 60s, there was an Aunt Jemima commercial that had a big, happy, friendly lady who cooked yummy food. I was an abused little girl, and I didn’t care if Aunt Jemima was black, white, or purple with green spots, I wanted to go live with her. I was sure she would take good care of me. Dear Tony. Thank you for taking your time to read my work. I am sorry to hear that you are growing tired with hearing about the history of enslaved Africans, which I am an United States of American descendant. The fact that you don’t like hearing the word African American is also an interesting dilemma for you–and I don’t have any clear suggestions on how you might deal with that. I am extremely proud of my country, and am in awe with how much we have accomplished in this country, in spite, of our fatigue, distrust, trauma, and confusion. Unfortunately, as you may or may not have known, the US constitution pointed out this divide that you speak of when they declared, “three-fifths clause (Article I, Section 2, of the U.S. Constitution of 1787) in fact declared that for purposes of representation in Congress, enslaved blacks in a state would be counted as three-fifths of the number of white inhabitants of that state. – See more at: http://www.blackpast.org/aah/three-fifths-clause-united-states-constitution-1787#sthash.MH1XSMlK.dpuf“, which in essence renders my ancestor’s identity as proportional to Whites. Representation politically and personally matter a great deal. #Blacklivesmatter, and I hope that doesn’t offend any of your sensibilities. I think that many people find offense to things because they often carry painful, harmful memories. While the store owner has the right, apparently, to display racist, stereotypical images, I am glad that I live in a country where I can write and express my displeasure with racist, anesthetic choices. Please keep reading my work, and thanks again for taking the time to write.